Above: the pool at the Villa Collazzi designed by Pietro Porcinai, a pioneering landscape architect, active in Italy from the 1930s through the 1960s. Enogastronomy has become my professional focus over the last fifteen years or so. But every time I return to Italy, I am reminded by what first drew me there: the Italians’ rich cultural and artistic legacy and the country’s many extraordinary works of art and immense natural beauty. 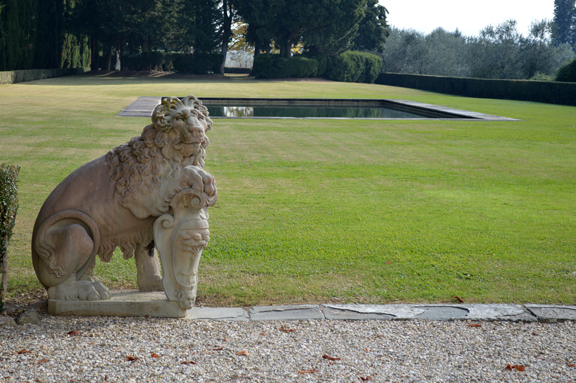 During my November trip, I took a break from the wine and food trail to visit the remarkable Villa Collazzi just outside of Florence. Above: a shot of the pool with the villa in the background. 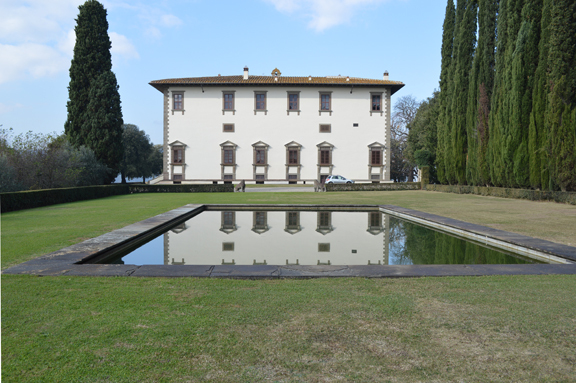 Note how the villa façade is reflected with perfect symmetry in the body of water. 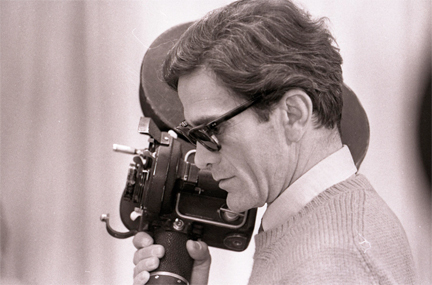 Comrade Howard graciously sent me these images from the current “Pasolini in Rome” exhibition at the Cinémathèque Française where he toured the show last week with the museum’s director. It runs through January 26. La poésie, la politique, le sexe, l’amitié, le cinéma… The stuff that life is made of. The track “Pasolini” in the slideshow comes from my band Nous Non Plus’ release Le sexe et la politique (Terrible Kids Music 2012). Happy International Workers’ Day (May Day)! 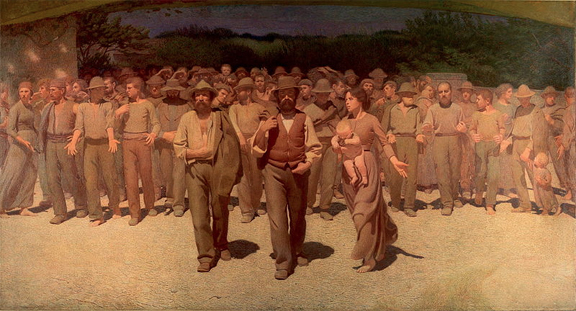 Above: “The Fourth Estate” by Pellizza da Volpedo (1901). Marx is not a four-letter word at our house. Happy International Worker’s Day, everyone! Tracie P really outdid herself yesterday night for our dinner, making a gorgeous summer farro salad with fresh and lightly blanched vegetables and fruits and hard-boiled egg. It’s a good thing she did because by the time dinner rolled around at our house, I was depressed. After reading the dismal news about Italy, the economy, the fall of Western Civilization, and the riots and looting in London (one of my favorite cities on earth), I couldn’t help but think about the last market crash in 2008 and the days that followed the tragedy of the Twin Towers in 2001. Those were tough times for the wine (and restaurant) industry and I hope they are not returning in the wake of the current crisis. But as Tracie P reminded me, no matter what happens, we’ll have each other and we’ll have Baby P when she arrives later this year. And for the first time in my life, as bleak as the world seems right now, my anxiety about the future is assuaged by Tracie P’s wonderful smile and her warm embrace — and a little girl growing inside her. And as bad as things may look, we all found joy and solace in some of the simplest pleasure in life: a bright summer dish and a bright, fresh bottling of Garganega by Suavia. The incipit of last night’s flight — the overture, the prologue — was a deceivingly humble bottle of 1997 Bourgogne blanc by Leroy. Friend and collector Michael Byington (environmental consultant by day) was in Austin on business and we met up at the happy hour at Trio (half-priced by the glass, appetizer menu, and free valet parking!). While I had brought a bottle to share as well, ubi major, minor cessat: his flight was so impressive that I tucked mine in my wine bag and just stuck around and enjoyed the incredible ride. It also brought to mind a special moment in my love affair with Tracie P: nearly three years ago, when we were still in a long-distance romance, I brought a bottle of 1997 Leroy in my checked baggage to Austin. Then, the glow of our new love was wrapped around us tightly (and still is as Tracie P carries la piccola Parzen, as at least one friend on the Facebook called her), and every wine we tasted together was a new adventure. The 97 Leroy was perhaps the first “intellectual” bottle we shared and an unforgettable moment when our palates came together like lovers floating in a painting by Chagall. As soon as the wine touched my lips, I was transported to that moment and could see Tracie P before me, her blue eyes twinkling, her golden hair shining, and her lips inviting me to taste… Aroma and flavor have such remarkably potent mnemonic power… And this wine was a window onto one of the happiest and most thrilling moments of my life. The 1990 Château Pavie was in fantastic shape… I couldn’t help but think of what Houston wine writer Dale Robertson had said to me the night before: to drink a wine too old can be a felony, but to drink too young is only a misdemeanor. In Italian, still life is called natura morta, literally, dead nature, in other words, inanimate nature. Yesterday, Tracie P and I visited the San Diego home of friends and wine club clients Chrissa and Dan, where we took these photos. After winning her battle with cancer, the couple decided to devote their lives to homesteading: they grow nearly all the produce that they consume and they slaughter and butcher all the meats that they consume (check out their site and educational program here). All of the fruits in these photos were grown by them in their garden. At a time when most of us urbanites place blind faith in the so-called “organic” choices at the specialized super markets, these folks — he a software designer, she an interior designer — have embraced the homesteading approach to self reliance (o that wonderful American ideal!) with a gusto and vibrancy that inspire me. I brought over a bottle of 2009 Pinot Grigio Jesera by my friend Giampaolo Venica. Look at the wonderful ramato (copper) color of this true Pinot Grigio (a red grape, btw). We raised a glass of this delicious salty wine and remembered the grape growers in Collio (Friuli) whose vineyards were devastated over the weekend by a terrible hailstorm. I also took a few shots in the garden — natura viva. I loved the red veined sorrel. Except for a tight connection in Paris, our trip has been seamless so far: we arrived this morning in Padua (Padova), checked into our hotel, and made a beeline for the legendary Bar dei Osei, a tiny hole-in-the-wall sandwich place in the Palazzo della Ragione. Tramezzino tonno e uovo sodo (tuna and hard-boiled egg) and tramezzino con la verdura cruda (raw vegetables), the latter a specialty of the Bar dei Osei. Isn’t it wonderful how some things never change? Took me back literally 20+ years! The signore were out and about doing their Saturday morning food shopping at the many vendors underneath the Salone, as the Palazzo della Ragione is known. You can always tell where the best stuff is to be found: just look for the lines! She hasn’t had a chance yet, but Tracie P is excited about her first taste of sfilacci di cavallo cured, shredded horse meat. Above: A still from Fellini’s 1973 Amarcord, screenplay by Tonino Guerra (image via Verdoux). “Tonino Guerra is by any standard one of the great writers of our times. His medium is the screenplay. He has written or co-written more than a hundred films, among them L’avventura, La notte, L’eclisse, Red Desert, Blow-Up, and Zabriskie Point for Antonioni; Amarcord for Fellini; Nostalghia for Tarkovsky; Landscapes in the Mist for Angelopoulos; and Exquisite Corpses for Rosi. Guerra’s work is the brave and moral thread that runs through the fabric of modernist cinema. He is a breathtaking poet, a generous collaborator, and is possessed of the largest heart. We are fortunate to have him among us and thrilled to honor his astonishing — and astonishingly influential — body of work,” said WGAW Board of Directors member Howard A. Rodman. Comrade Howard’s list of Guerra’s credits reads like my personal list of all-time favorite movies. IMHO the Antonioni tetralogy L’avventura, La notte, L’eclisse, and Red Desert is the greatest work of cinematic art ever achieved. Chapeau bas, WGAW! One of the greatest artists of the last and current centuries, Italian film director Mario Monicelli, father of the commedia all’italiana, took his own life last night. He was 95 and terminally ill. Please also see this obituary in the ANSA feed, where actor Stefania Sandrelli interprets his suicide. I studied and loved his films in graduate school and have quoted them often here on the blog. The scene below (with Totò, Marcello Mastroianni, and Vittorio Gassman) is my favorite from I soliti ignoti (Big Deal on Madonna Street, 1958). My favorite gag is when Mastroianni asks Totò if the famous safe-cracker Fu Cimin was Chinese. No, says, Totò, he was from Venice. “Cimin” was his last name. “Fu” means he died, he says. Comrade H brought the news to my attention over the weekend. Italian screenwriter Suso Cecchi d’Amico left this world last Saturday. Here’s the obituary in The New York Times. And see this post by ANSA. She contributed to some of the greatest movies of all times and she did so in at a time when few women worked as writers in the Italian film industry. The number of classic films on which she collaborated are too many to list here but you know her work the way you remember your Sunday prayers: Bicycle Thieves, Miracle in Milan, Rome Open City, Big Deal on Madonna Street, The Leopard, and the list goes on and on, nearly every one of them a sine qua non of the twentieth century. Man, they don’t write ’em like that anymore, do they, Comrade H?